MANAGER of the Little Rock TV Communica­tions and Hotel proprietor Rockcliffe Christie is calling for a working relationship among TV Communica­tions operators in Guyana for the benefit of all Guyanese. Panic Buying AS THE country prepares for a possible total shutdown of electricity, there have been reports of abnormal purchasing of food supplies. 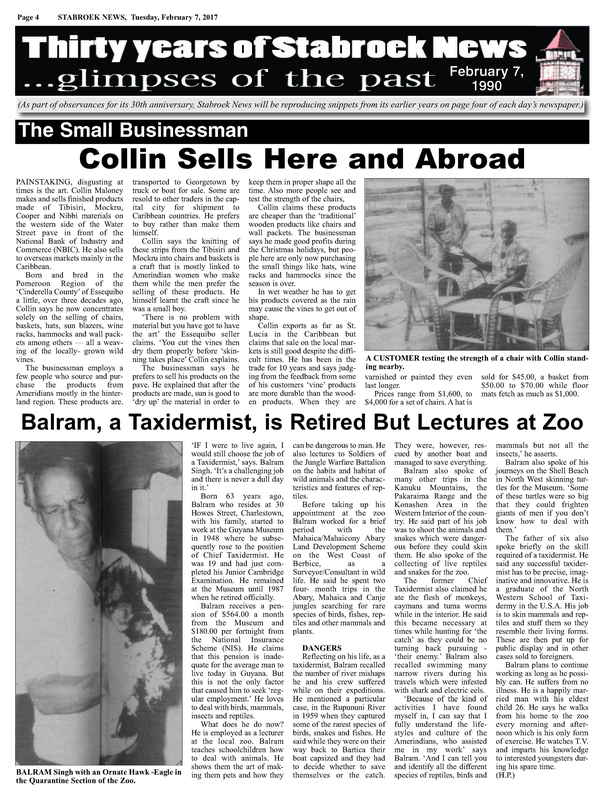 Collin Sells Here and Abroad PAINSTAKING, dis­gusting at times is the art. Collin Maloney makes and sells finished products made of Tibisiri, Mockru, Cooper and Nibbi materials on the western side of the Water Street pave in front of the National Bank of Industry and Commerce (NBIC). Stabroek Exclusive.., Gregory Smith Talks With Sharief Khan How Did Rodney Die? 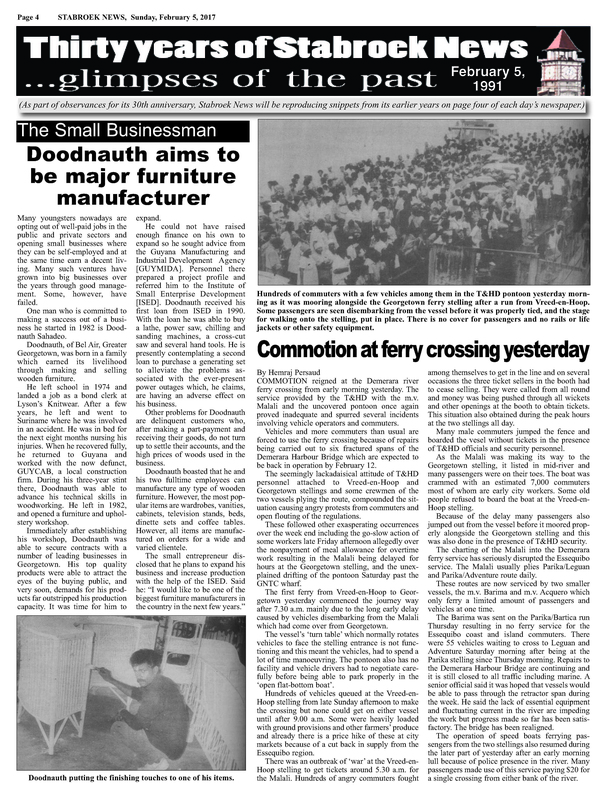 THE June 13, 1980 car bomb-blast death of well-known politician and historian Dr.
Doodnauth aims to be major furniture manufacturer Many youngsters nowadays are opting out of well paid jobs in the public and private sectors and opening small businesses where they can be self-employed and at the same time earn a decent living. 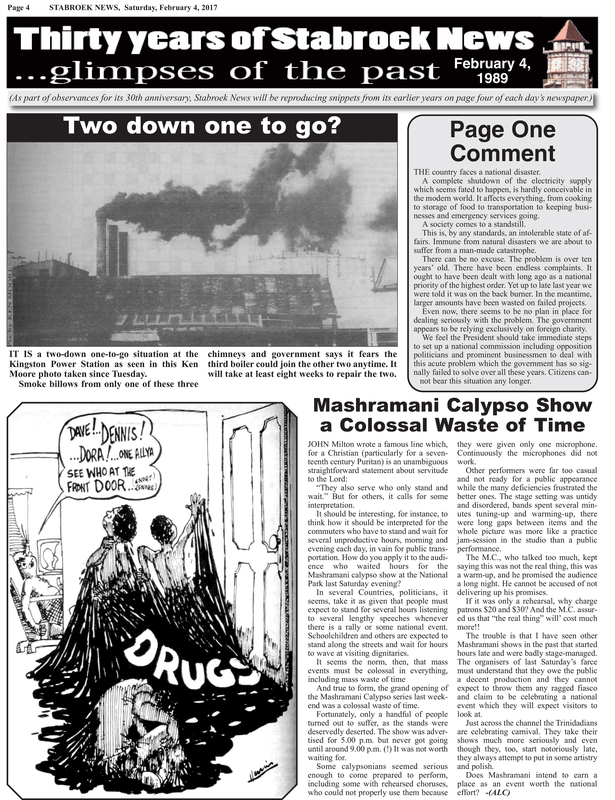 Page One Comment THE country faces a national disaster. A complete shut­down of the electri­city supply which seems fated to hap­pen, is hardly con­ceivable in the mod­ern world. 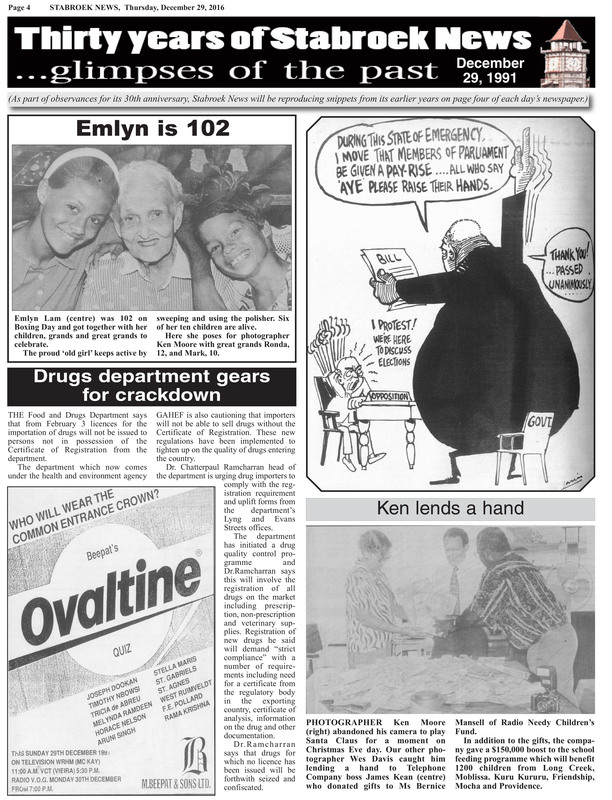 Sydney Gonsalves – Guyana’s Memory Man By MARGARET KENDALL SYDNEY Holbert Gonsalves, also known as the ‘Memory Man,’ is something of a legend in Guyana. The young mysterious millionaires are here Talking to you(th) By Shaun Samaroo QUICK wealth. Our Man In Havana PRESIDENT Hoyte’s recent visit to Cuba has attracted some comment. Mohan Favours Durability Over Style The Small Businessman “I HAVE been a carpenter/joiner for 24 years and my advice to customers is not to sac­rifice durability for style,” Mohan says. By SHARIEF KHAN MYSTERY stalked the Parliament chambers last week Tuesday and walked arm in arm with fashion as the House was thrown into confusion over a case of some missing documents. 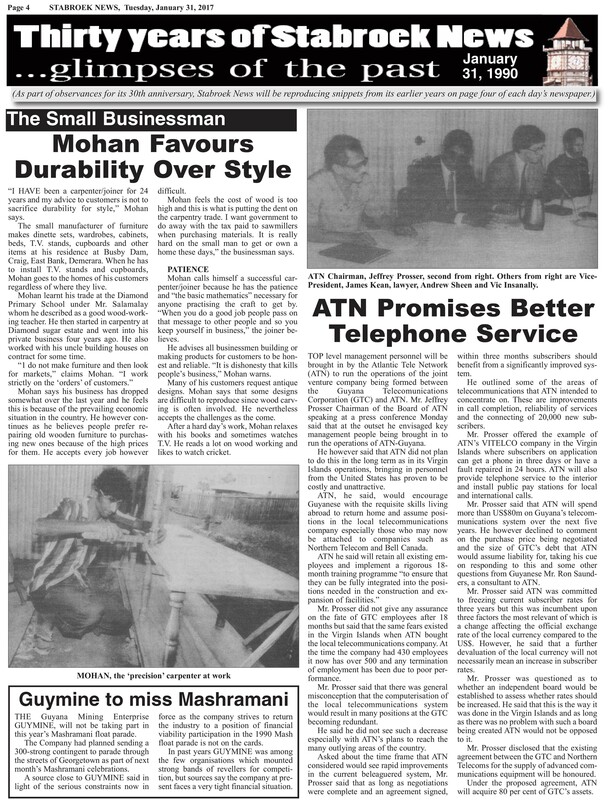 ATN closes deal Improvements likely in two months By Sharief Khan AFTER several postponments, the US Virgin Islands-based ATN telephone company yesterday closed the deal to immediately take over the running of the local telecommunications network. Urgent Need for Life jackets PASSENGERS making the Parika-Supenaam river crossing in motor boats, have accused operators of endangering their lives because of overloading, lack of life jackets and reckless sailing. 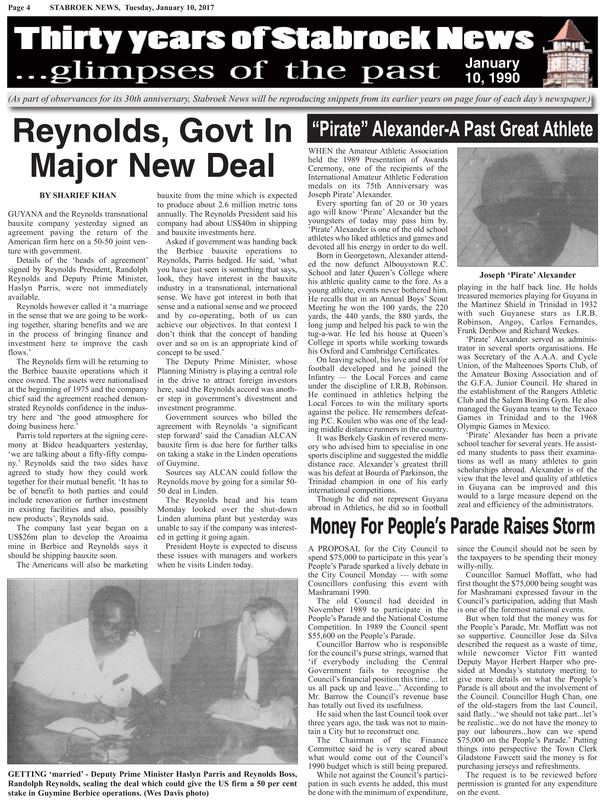 New Skipper Full Of Confidence… We’ll Retain Championship JERRY ANGUS was born at Belladrum on the West Coast of Berbice on May 12, 1960 and although he may have harboured dreams of making it to the top, he could have never guessed that he would have done so in this manner. Mayor plans shopping mall for Bourda Green CITY Mayor Compton Young says he plans to set up a two-storey shopping mall on Bourda Green, which will in­clude a bank, cinema and two restaurants. Conditions worsen at UG UNIVERSITY of Guyana Vice-Chancel­lor Dr. George Walcott said yesterday the in­stitution has been forc­ed to use its own money to speed-up re­habilitation work on the campus, following delays in the Inter-American Development Bank rehabilitation pro­gramme. 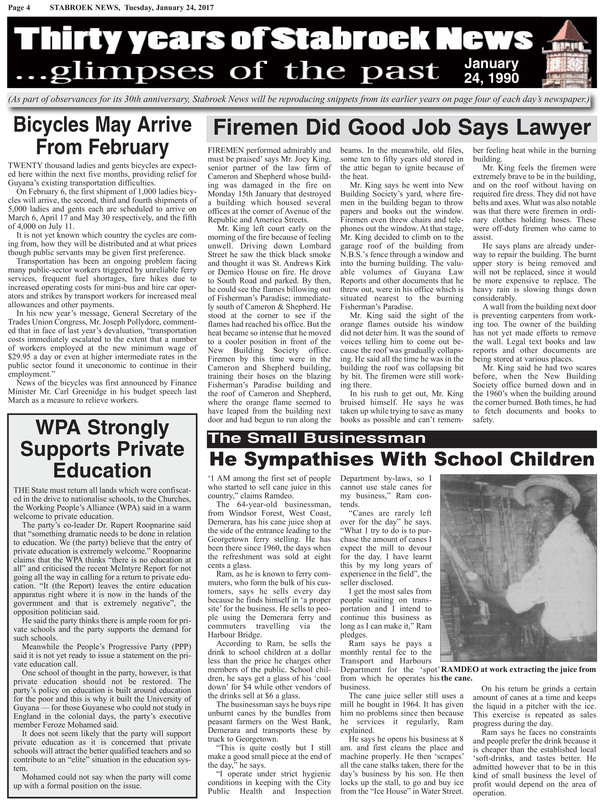 Bicycles May Arrive From February TWENTY thousand ladies and gents bicycles are expected here within the next five months, providing relief for Guyana’s existing transportation difficulties. Guyana devalues $ Greenidge Presents A Ten-To-One Is Murder Budget By SHARIEF KHAN FINANCE Minister Mr. Remember, celebrate, act Observing a minute of silence in commemoration of the birthday of the late civil rights leader Reverend Dr. 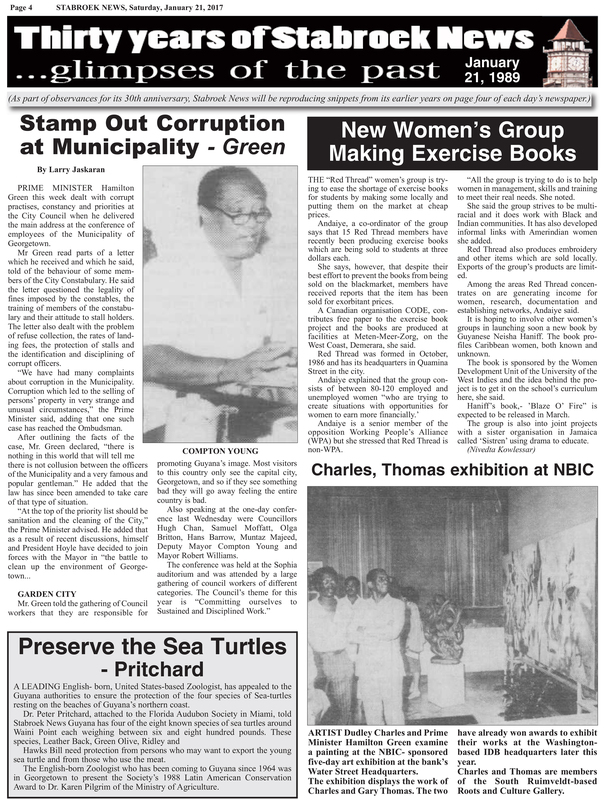 Stamp Out Corruption at Municipality – Green By Larry Jaskaran PRIME MINISTER Hamilton Green this week dealt with corrupt practises, constancy and priorities at the City Council when he delivered the main address at the conference of em­ployees of the Muni­cipality of George­town. Fire Equipment Below Efficiency – Loncke THERE ARE fourteen operational fire-fighting vehicles in Guyana, accord­ing to Chief Fire Officer Mr.
PPP denies receiving KGB funds THE opposition PPP is denying claims by the PNC that it had been funded by the former Soviet KGB while in power in the early 1960s and is challeng­ing the ruling party to prove “its false allega­tion”. City Location Would Boost Business The Small Businessman MARK MARS, 27, has been in the elec­tronics business for six years now. Deputy Mayor Warns Of Noise Nuisance Danger To City THE noise nuis­ance in and around the city, described by Deputy Mayor, Herbert Harper, as an annoyance, is to get the ‘Number Two Citizen’s’ spec­ial attention. Spare Engine For TU154M Coming From Cuba (By Bert Wilkinson) JOLTED by a re­cent top manage­ment shake-up and problems with its only jet aircraft, the State-owned Guy­ana Airways has said that it is moving to have its TU-154M aircraft back in ser­vice at the end of the week or early in the next. Pandemonium in Parliament By Anand Persaud Pandemonium broke out in the National As­sembly yesterday as the People’s Progressive Party (PPP) succeeded in disrupting the session during which a drinking glass was hurled in the direction of the Speaker, Sase Narain and the en­tire opposition walked out during debate. Ernest Christiani passes on WELL-KNOWN business executive Mr. Ernest Christiani died this week at 68 and was buried Thursday. Agony for Stranded Passengers Jobs in danger By SHARIEF KHAN BAIJNAUTH, of Flushing, Queens in New York, his wife and three children should have been back in New York since January 4. That was then… SCHOOL’S open again and parents are pondering, as usual, the whole education dilem­ma. 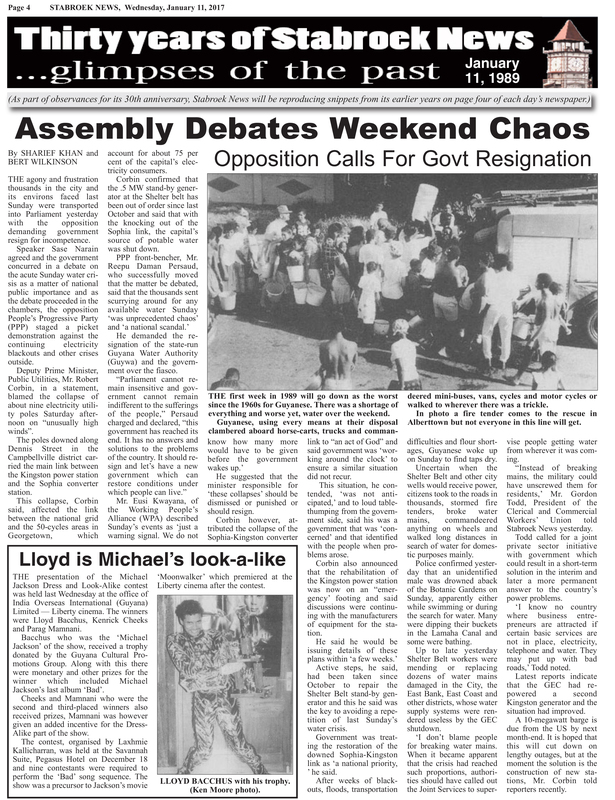 Assembly Debates Weekend Chaos Opposition Calls For Govt Resignation By SHARIEF KHAN and BERT WILKINSON THE agony and frustration thous­ands in the city and its environs faced last Sunday were transported into Parliament yester­day with the opposi­tion demanding gov­ernment resign for incompetence. Reynolds, Govt In Major New Deal BY SHARIEF KHAN GUYANA and the Reynolds transnational bauxite company yesterday signed an agreement paving the return of the American firm here on a 50-50 joint venture with government. Mute Youth Stows to New York A MUTE 15-year- old who frequents the airport and is well-known to the airport commun­ity, including secur­ity personnel, just missed his chance of migrating to the US. Letters National Archives are a disgrace Imagine the shock I encountered when I entered the Main St archives and was told rather petulantly by a female attendant: “sorry, we don’t have any information about national monuments.” NATIONAL MONUMENTS was the only phrase that had rolled off my tongue though I went in there to update information on a novel I am presently working on, and wanted to scan copies of the nineteenth century COLONIST paper. 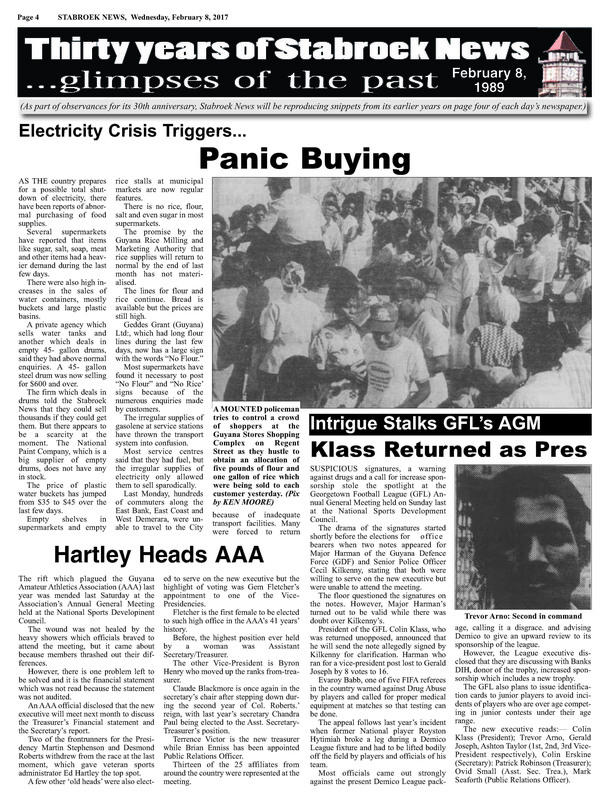 GEC Shutdown in First Week 1989 Workers, Commuters Severely Affected By BERT WILKINSON AREAS in Georgetown and other districts fed by the Kingston Power Station re­mained in darkness last night following this week’s shutdown of the station caused by what a corporation statement said was a ruptured tube in one of its condensers. Teething Problems in New Bus System(By BERT WILKINSON) ALTHOUGH the long-awaited coding system for mini-buses has been in effect nearly a week now, scores of commuters are still at a loss to determine which buses ply which routes. by Frederick Kissoon FEW, if any, would deny that the world today is interdepen­dent. 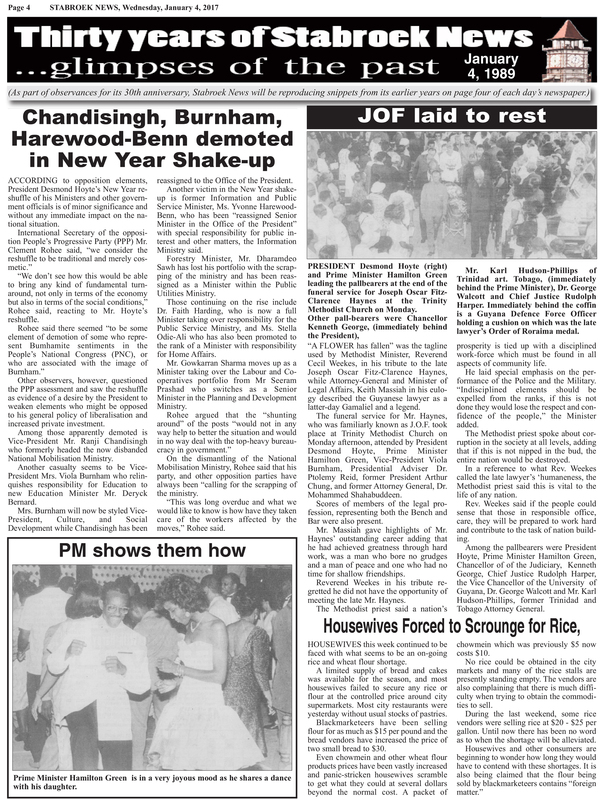 Chandisingh, Burnham, Harewood-Benn demoted in New Year Shake-up ACCORDING to opposition elements, President Desmond Hoyte’s New Year re­shuffle of his Ministers and other govern­ment officials is of minor significance and without any immediate impact on the na­tional situation. An Unusual Steel Band of Handicapped Children And the Dedicated lady who taught them TOTALLY oblivious of his surroundings, mentally retarded Ter­rence Gittens the star of the David Rose School for the Handi­capped, beats his pans playing from his soul. 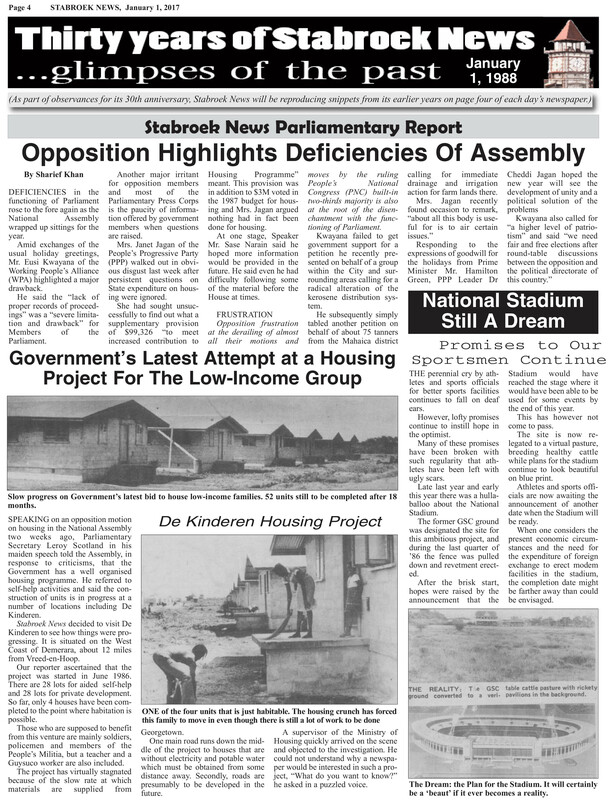 Opposition Highlights Deficiencies Of Assembly Stabroek News Parliamentary Report By Sharief Khan DEFICIENCIES in the function­ing of Parliament rose to the fore again as the National Assembly wrapped up sittings for the year. 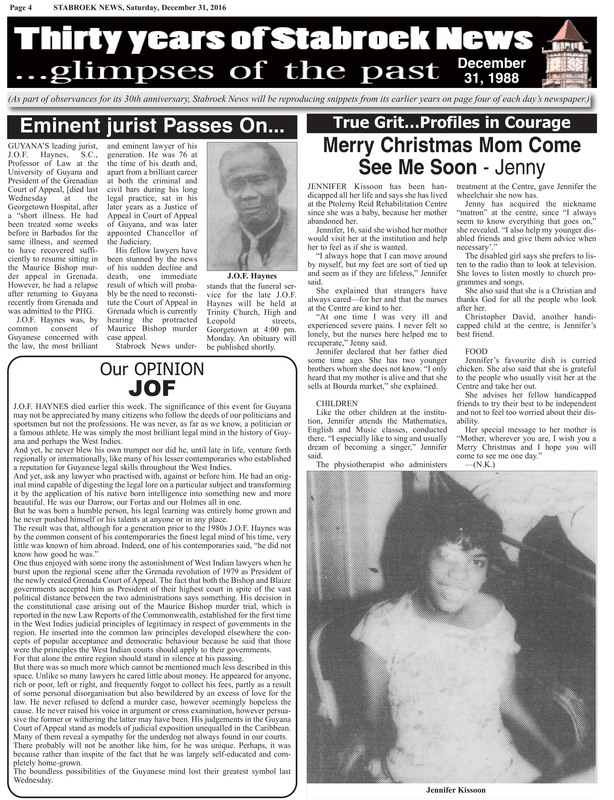 Eminent jurist Passes On… GUYANA’S lead­ing jurist, J.O.F. Haynes, S.C., Profes­sor of Law at the University of Guy­ana and President of the Grenadian Court of Appeal, [died last Wednesday at the Georgetown Hospital, after a “short illness. 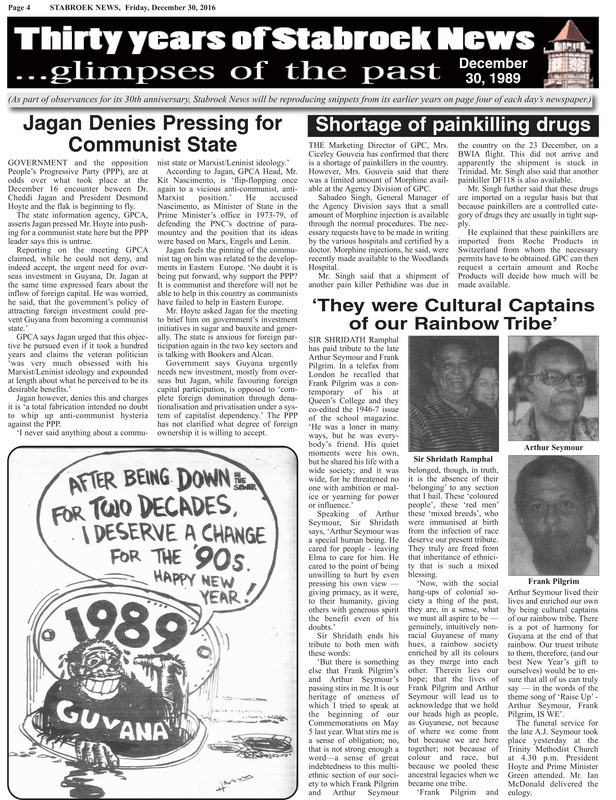 Jagan Denies Pressing for Communist State GOVERNMENT and the opposition People’s Progressive Party (PPP), are at odds over what took place at the December 16 encounter beween Dr. Drugs department gears for crackdown THE Food and Drugs Department says that from February 3 licences for the importation of drugs will not be issued to persons not in posses­sion of the Certificate of Registration from the department. 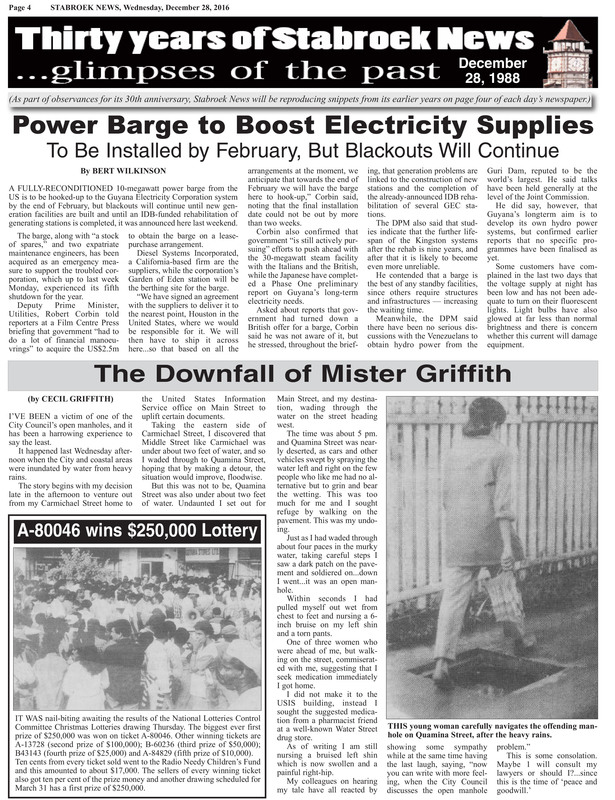 Power Barge to Boost Electricity Supplies To Be Installed by February, But Blackouts Will Continue By BERT WILKINSON A FULLY-RECONDITIONED 10-mega­watt power barge from the US is to be hooked-up to the Guyana Electricity Cor­poration system by the end of February, but blackouts will continue until new gen­eration facilities are built and until an IDB-funded rehabilitation of generating sta­tions is completed, it was announced here last weekend. Govt Denies Housing Programme in Shambles BY SHARIEF KHAN GOVERNMENT last week denied its housing programme was “a rather dismal picture” and claimed it has a “well-conceptualised and organised plan.” Parliamentary Secretary Mr.
Schools Still Plagued By Text Book Shortage A SENIOR education official says the Ministry of Education is hard put to resolve the critical textbook problem in most of the country’s 385 primary and 57 secondary schools. Page One Comment THE U.S. military invasion of Panama is unjustifiable. It is particularly tragic that it comes at a time when the Brezhnev doctrine of limited sover­eignty in Eastern Europe has been disavowed by Mr. Editors agree to avoid invasion of privacy THE editors of the Mir­ror, Stabroek News, Chronicle and Catholic Standard met this week to consider a complaint by the Mirror that a recent Chronicle report on the suicide of the wife of a prominent politician was insensitive and un­professional in that it referred to an unnamed illness from which she believed she suffered giving rise to an innuen­do that she had a fatal contagious disease and thus smearing herself and her family. Another Regent St fire HEAVY rains throughout yesterday hampered the probe into the cause of an early morning fire which razed the concrete and wooden complex at the corner of Regent and Camp streets after midnight Mon­day. Left to right Roy Heath, England-based Guyanese writer who won the Guyana Prize for the Best Book of Fiction, with his novel work ‘The Shadow Bride’, Mr Martin Carter acclaimed Guyanese poet who won the Guyana Prize for the Best Book of Poetry with his ‘Selected Poems’ and Canada-based Guyanese writer Brian Chan who won the Guyana Prize for the Best First Book of Poetry for his ‘Thief with Leaf’ seen sitting together at the presentation ceremony at the National Cultural Centre Monday night. “HE has done his work and done it faithfully and well. 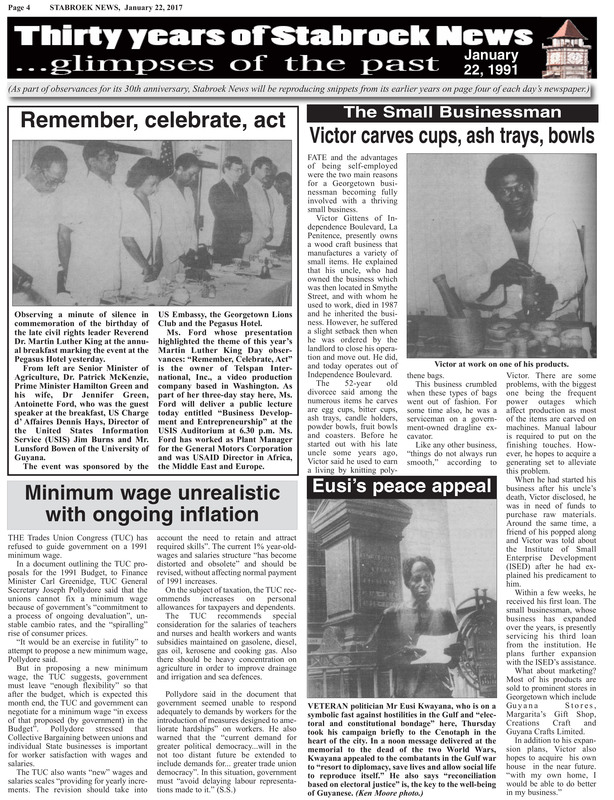 We must now do ours…” the words of President Des­mond Hoyte during his short statement at Sunday’s com­mittal of the last mortal remains of Guyana’s first elect­ed President Linden Forbes Sampson Burnham.